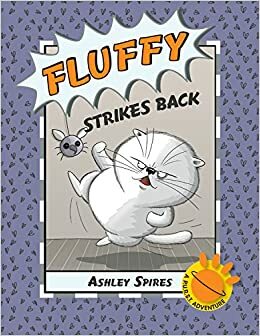 Summary: Fluffy is the lead cat of P.U.R.S.T. (Pets of the Universe Ready for Space Travel). Although he used to work out in the field, he now spends his days behind a desk five stories underground, protecting the humans and pets of the world from aliens. But one day, those aliens (insects) invade P.U.R.S.T. headquarters, and Fluffy has to spring back into action to defeat them. It’s a tough job, but with the help of his right-hand cat and chief engineer guinea pig (hamster? ), Fluffy is able to get the job done. 72 pages; grades 1-4. Pros: A fun beginning graphic novel; not too much text, but plenty of cat action. Cons: A bit of bathroom—or rather, litter box–humor.